College coaches continued to pack the bleachers here in Milwaukee to watch and evaluate prospects from across the country. With coaches coming from Kentucky, Michigan, Notre Dame, Louisville, Clemson, Florida, Wake Forest, Kansas, Nebraska, UCLA, and many more there was no shortage of talent in the gym. Here are some of the prospects that stood out to me on day two. Markese Jacobs – 2019 (Mac Irvin Fire 17u) - The 2019 Kansas commit was on full display all day long for the talented Mac Irvin Fire squad. After converting a tough and-1 lay in to take the lead in the final moments of Mac Irvin's grind it out win over REACH Legends Jacobs wasn’t finished. Jacobs had another game winning lay in at the buzzer to lift Mac Irvin over KC Run GMC. He finished with 26 points in the win over REACH Legends. Tyrese Hunter – 2021 (Milwaukee Spartans 15u) - Hunter is a name to remember in the deep and talented 2021 Wisconsin class. In the Spartans tough loss to Illinois Wolves Hunter did everything in his power to bring his team back and keep it close until the final moments. He scored off the bounce and was finishing at the rim using his athletic ability to rise over defenders. He knocked down multiple deep threes and was doing so with defender's hands all over him. He is a name to remember over the course of the next couple of years. Patrick Baldwin Jr – 2021 (Phenom University 16u) - Baldwin has been showing why he is considered as one of the top 2021 prospects in the country. Standing at 6-8 Baldwin has an extremely smooth style of play making it easy for him to play multiple positions. He is one of the best shooters in the country no matter the class and so far this week he has proven just that. He excels in transition using his length to his advantage to glide by defenders and has shown that he can finish around the rim through tough defense. Baldwin finished with 17 points in Phenoms win over Quad City Elite. Jeremiah Robinson-Earl – 2019 (KC Run GMC 17u) - There was a lot of hype over Earl this past week and after watching him play I can see why. A top 25 prospect nationally, Earl was on full display for KC Run GMC. He has a rare combination of athleticism and skill that allows him to break down bigger defenders and over power smaller ones. He threw down multiple impressive dunks that had the gym on their feet late Thursday afternoon. He proved that he has a nice jump shot and can even step out beyond the arc and knock them down too. 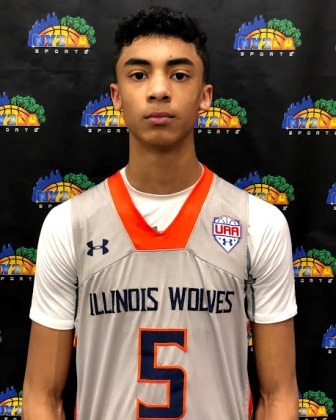 Max Christie - 2021 (Illinois Wolves 15u) - A top 25 prospect nationally in the class of 2021 Christie has been an offensive threat for the Wolves helping them to an undefeated record thus far into the tournament. In a grind it out win over the Martin Brothers Chirstie did everything in his power to lead them to a win. He can take the ball for the full length of the floor and dribble through defenders extremely smoothly making it look effortless at times. He has a solid jump shot and has a good pull up game. He finished with 18 points in Wolves win. Kahlil Whitney – 2019 (Mac Irvin Fire 17u) - Whitney was phenomenal opening night and Thursday was no different. There is no question why Whitney has been the talk of the tournament so far as he has taken his game to the complete next level. He has a deadly mid-range jumper, great finisher, and has some very nice post moves. Whitney continues to rise in the rankings and for good reason. High majors have lined up watching the 2019 prospect all week long as Kentucky has been the latest to show serious interest. Harlond Beverly – 2019 (REACH Legends 17u) - Beverly had one of his best performances of July and it just so happened to be in front of 100 plus division 1 coaches. The top 50 national recruit put on a show in REACHs tough loss to Mac Irvin Fire as the lost in the final seconds. He was hitting midrange jumpers from all over the floor, scored in transition well, and was setting his teammates up for easy buckets. He has a host of high major offers as Michigan State, Texas, and Baylor are among the schools that stand out at this point. Brandon Newman – 2019 (Nike Meanstreets 17u) - Newman had a breakout performance against Sizzle as he was virtually ungradable in the first half. There wasn’t a spot on the floor that he did have confidence letting it fly from, was shooting off the bounce and off the catch, and finishing tough around the rim converting multiple and-1s. Newman has offers from Indiana, Ohio State, Purdue, Florida State, Maryland, Virginia Tech, and many more high major programs. He finished with 22 points in Meanstreets win. Zach Harvey – 2019 (KC Run GMC 17u) - Harvey has been one of the most impressive prospects in the gym thus far as he has been putting on scoring displays game in and game out. A true shooting guard he is a silky-smooth scorer from all three levels. He can blow by defenders with his change of speed and dribble combos often making his defenders look silly. His layup package is elite and he can also rise up and throw down some impressive dunks. He holds offers from Kansas, Iowa State, Creighton, and many more high major programs. Jalen Suggs – 2020 (Sizzle 17u) - Suggs was on full display Thursday night making play after play. One of the top 10 prospects nationally in the 2020 class he showed why he has interest and offers from virtually every top program in the country. The two-sport standout is one of the best two-way player I've watched as he is an excellent lead guard and an outstanding defender as well. He finishes at the rim through hard contact at a high rate, can shoot it from the outside, and has great court vision. He had multiple chase down blocks as well as steals leading to easy fast break buckets. Delaware Hale – 2020 (WI Swing 16u) - Hale had an excellent showing for Swing in their win late Thursday night. He had college coaches buzzing as he threw down a handful of impressive dunks and knocked down a pair of midrange jumpers as well as a deep three ball. A rising prospect in the loaded 2020 badger state Hale has a lot to work on still but the raw talent is there, and he is turning himself into a legitimate division 1 prospect. Hale finished with 14 points in Swings win. Jakobe Thompson – 2021 (Milwaukee Spartans 15u) - Thompson has proven himself as a scorer over the last 12 months and in the night cap game late Thursday night he did just that. His crossover is lethal as he shifts defenders, his pull up game is deadly when he gets going, and he is a very creative finisher around the rim. Thompson will be one of the more talked about 2021 prospects in Wisconsin when it is all said and done. He finished with 20 points in the Spartans win.